This is a very insightful video directly from the Google development team and may help you better understand the complexities of a Google search. Just came upon another excellent article about website marketing that I want to share – although this article provides the blue print for the work we do for FindMyLocalBiz clients we feel reading this information will enable a deeper understanding of how complex and detailed website marketing truly is. We trust you’ll take the time to read through The Web Marketing Checklist: 37 Ways to Promote Your Website by Dr. Ralph F. Wilson, and let us know how this helps you and your business grow. Recently a prospective local business owner whose existing website is not performing to expectations approached us for a proposal to update and revise their website to current market conditions regarding content density, keyword phrases, search engine optimization (SEO). An analysis also showed the need for revising the site navigation so that each content page would be no more than 2 clicks away at any given time – now it can take as much as four clicks to locate and access desired content on her site. The question clearly implies that the state of their business is not strong. More importantly, how to answer that question – truthfully or with an answer she wanted to hear? It would have been easy (and short range in our thinking) to simply say “yes, a revised website will turn your business around” to quickly close the deal. But all our sales training says be truthful, even when it is a harder road to take. And so to answer her question, we explained to her clearly that a redesigned website (or any website for that matter) should not be expected to be the only source of new business, rather it is another arrow in the quiver of local business marketing. A well designed website works in conjunction with current print ad campaigns, store signage, direct mail, radio advertising, in-store customer experience, business cards and even PPC (pay per click) advertising campaigns. When done correctly, each part of the marketing puzzle works in support of the others, delivering similar messages, building the brand and attracting customers and clients to your business. She understood. The asked us to have a look at all the things she’s doing and tell her if it all ties together as it should, which we are in the process of doing now. We earned a larger piece of her business now as both web designers AND marketing consultants; She’ll get a complete analysis or her marketing strategies and tactics as well as an up-to-date well designed business website aligned with all the aspects of her business. And with that, have a Happy & safe 4th! OK, as a business owner you’ve got your site up and running, maybe you’ve just added a new page or product info. Now all you have to do is wait for customers to find you in online searches. Well unfortunately it isn’t that simple. Kevin Costner in Field Of Dreams was wrong, just because you build it does not mean they’ll come. Like everything else in this life, if you want it you’ll have to work for it. The good news is that submission of your site to the major search engines is not too difficult. It can take a few hours or even a few days for your site to be indexed but it will happen and eventually you’ll see your page rank go up and your traffic increase. Try these tactics and let us know how it worked out for you. I attended a business networking meeting this morning where I met about 20 like-minded local business owners from a variety of industries – lawyers, dentists, CPA’s, computer repair, IT to name a few. Each has the need to grow their business as well as help others in the group grow theirs by referrals. And in fact I witnessed about a dozen written referrals actually change hands, indicating this business networking group is working. Group discussions touched upon how they market their business, and to my selfish interests, what each of these companies do regarding Internet marketing, and how they use (or do not use) their websites as marketing tools. Not surprising most admit to needing help in that area. After all, they are lawyers, dentists, CPA’s and real estate agents, not Internet marketing pros. They spend their days running their business and while marketing should be a key component of that activity, too often it is not. Frankly that’s why we have a business, to help those local business owners that do not have the time , inclination or knowledge to do Internet marketing on their own. 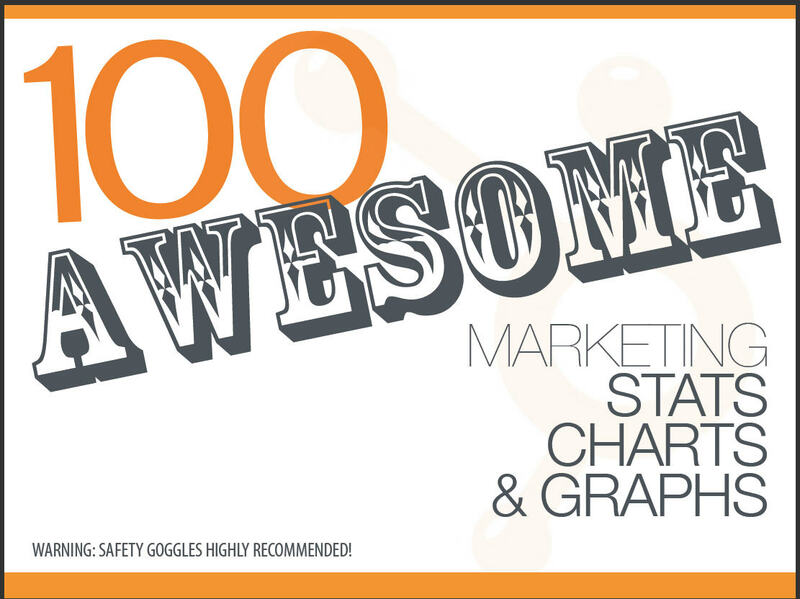 And then I was received this “100 Awesome Marketing Charts” from HubSpot in my email! Clearly illustrating the impact that the Internet, Google, & Social Media (Facebook, Twitter & LinkedIn) have had on how consumers search & find new local businesses, it is a most enlightening read for all of us involved in online marketing at any level. You may want to read this yourself, and you can download your free copy here . Have you ever received a call – perhaps even a robocall – guaranteeing you position #1 or page 1 positioning in Google’s search results? No one can guarantee a #1 ranking on Google. Beware of SEOs that claim to guarantee rankings, allege a “special relationship” with Google, or advertise a “priority submit” to Google. There is no priority submit for Google. In fact, the only way to submit a site to Google directly is through our Add URL page or by submitting a Sitemap and you can do this yourself at no cost whatsoever. (3) Complete Place pages that contain the information consumers want to know most. (4) The citations and backlinks to your site to give it the kind of authority that Google recognizes and rewards. So let’s say you follow the rules and then one day your business starts showing up on Google’s first page of results? What will that mean to your business? The answer may be, “Nothing at all.” It all depends on the quality of your website and how well it answers or addresses a searcher’s needs. All too often, we find that many businesses become disillusioned when they get no calls or inquiries, even if their sites are featured on page 1. The reason? Probably the site itself. And that’s the dirty little secret of local Internet marketing: No matter how high your position might be on Google, if your website is poorly designed and written, doesn’t answer the searcher’s needs, you will likely not get any response. Which may mean it’s may be time to take a fresh look at your site. If you built your site yourself, perhaps it’s time to turn to the service of a professional web designer who can deploy skills and tools. And if you authored the site’s content, you may want to employ the services of a professional copywriter who understands the nuances of writing for the web, especially at a time when search engine optimization is so important. So if you’re goal is to get your business #1 on Google, remember what Google said: “No one can guarantee a #1 ranking on Google.” And remember if you eventually do get to #1, it’s best that you put your best foot (your website) forward. If you’re old enough to remember Henry Gibson on TV’s Laugh-In, then you’ll remember his famous poetry segments called “Keep A’Goin”. In those Henry talked about the daily life challenges tossed his way and how he was determined to keep a’goin to overcome the challenges. Owning and running a business is often like that. One week you may feel as if the world is against you and nothing is going right, and then suddenly things turn your way. This past week we experienced the true business value of employing the Keep A’Goin philosophy. During the past months we had many sales meetings, new business presentations and even planned on a revised business model. Things were moving but very slowly. Some days we were getting discouraged, and then… three of those we had previously spoken with called to sign up for our Intent marketing services. Best of all two of these have also given us referrals for new assignments. How great is that! So remember that during those inevitable down periods, it is wise to always Keep A’Goin. The fact that we keep on going through hard times eventually paid off and will for you, too.